Late last night, students were working on setting up their installations for the annual MLK exhibit. The exhibit is a part of an IAP course, Martin Luther King, Jr. Design Seminar (17.922). This year’s exhibits address topics such as police brutality and lack of diversity at the Academy Awards. A team of 25 MIT students took the Best Overall Design award in the first stage of SpaceX’s Hyperloop Pod competition this weekend. Their design for a pod that will shuttle between San Francisco and LA at prodigious speeds beat those of over 120 teams at the competition’s Design Weekend, held at Texas A&M University. 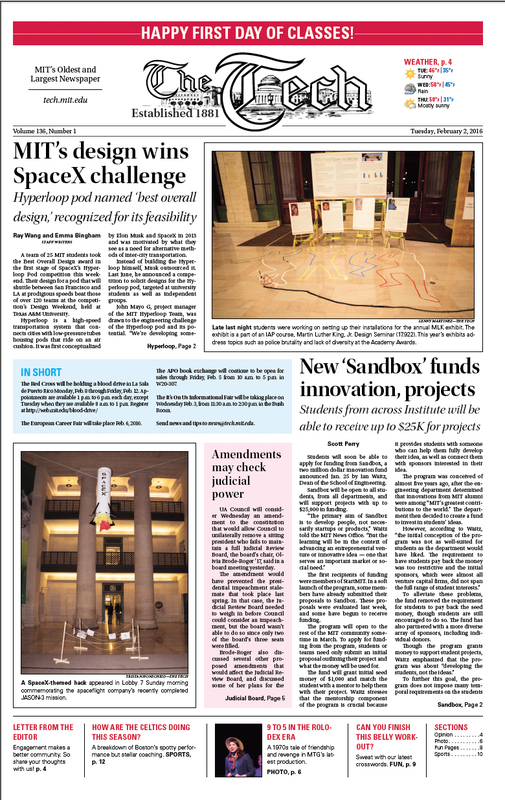 Students will soon be able to apply for funding from Sandbox, a two million dollar innovation fund announced Jan. 25 by Ian Waitz, Dean of the School of Engineering. The UA Council will consider next Wednesday an amendment to the constitution that would allow Council to unilaterally remove a sitting president who fails to initiate the process of filling a vacancy on the Judicial Review Board, the board's chair, Olivia Brode-Roger '17, said in a meeting yesterday. The Fossil Free MIT sit-in is no longer continuous, with participants occasionally disbanding if administrators are not present. Sometimes the sit-in may disband if &quot;there are only a couple of people there,&quot; Geoffrey Supran, a member of the group, said.